1. One of the earliest writers of the Christian Church; lived at Rome, whither he had gone about 150 from Palestine or Syria, by way of Corinth; died about 189. According to Eusebius, he was by birth a Jew; and though this is only an induction on the part of Eusebius, it may be accepted as true. He wrote, in five books, a work entitled ϓπομνήματα Πέντε, or Πέντε Συγγράμματα, a historical apology for Christianity, in which he attempts to prove the truth and continuity of Christian doctrine in the apostolic churches and also the succession of bishops. It was indirectly aimed against Gnosticism and heresies in general. Of Jewish heretical sects he mentions seven (Eusebius, "Hist. Eccl." iv. §, 21): Essenes, Galileans, Hemerobaptists, Masbotheans, Samaritans, Sadducees, and Pharisees. He cites the apocryphal gospels of the Hebrews and of the Syrians, Jewish traditions, and Judæo-Christian literary productions. He is thus an important authority for Jewish heresies and for the earliest history of the Christian Church. Only fragments of the ϓπομνήματα Πέντε, or Πέντε Συγγράμματα have been preserved—in the "Historia Ecclesiastica" of Eusebius and (one extract) in Photius, "Bibliotheca," p. 232.Bibliography: Hilgenfeld, in Zeitschrift für Wissenschaftliche Theologie, 1878, p. 304; idem, Ketzergesch. pp. 30, 84; Harnack, Gesch. der Altchristlichen Litteratur, i. 483; idem, Chronologie der Altchristlichen Litteratur, i. 180 et seq. 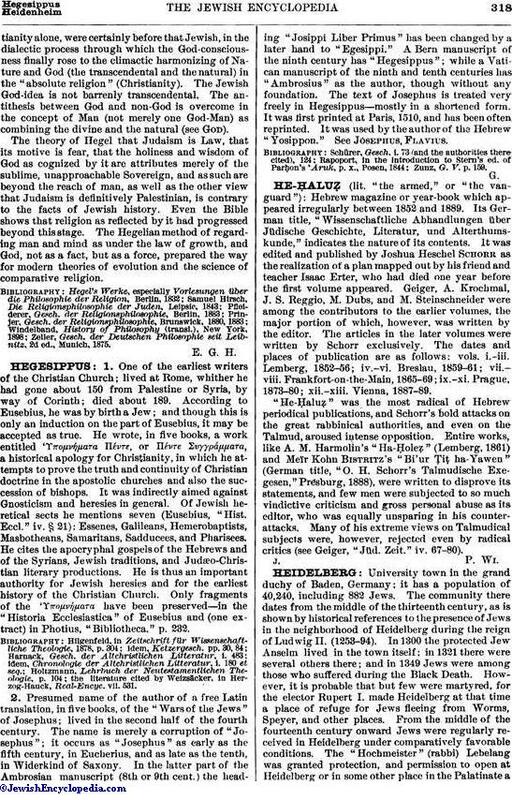 ; Holtzmann, Lehrbuch der Neutestamentlichen Theologie, p. 104; the literature cited by Weizsäcker, in Herzog-Hauck, Real-Encyc. vii. 531. 2. Presumed name of the author of a free Latin translation, in five books, of the "Wars of the Jews" of Josephus; lived in the second half of the fourth century. The name is merely a corruption of "Josephus"; it occurs as "Josephus" as early as the fifth century, in Eucherius, and as late as the tenth, in Widerkind of Saxony. In the latter part of the Ambrosian manuscript (8th or 9th cent.) the heading "Josippi Liber Primus" has been changed by a later hand to "Egesippi." A Bern manuscript of the ninth century has "Hegesippus"; while a Vatican manuscript of the ninth and tenth centuries has "Ambrosius" as the author, though without any foundation. The text of Josephus is treated very freely in Hegesippus—mostly in a shortened form. It was first printed at Paris, 1510, and has been often reprinted. It was used by the author of the Hebrew "Yosippon." See Josephus, Flavius.Bibliography: Schürer, Gesch. i. 73 (and the authorities there cited), 124; Rapoport, in the introduction to Stern's ed. of Parḥon's 'Aruk, p. x., Posen, 1844; Zunz, G. V. p. 159.G.